Innovation = Insight, Plan and Commercialization? The schedule view in Outlook 2010 looks like it could be really useful. I’ve been trying out the Beta version of Outlook 2010 at home with my private email account but not for scheduling meetings with others. Screenshot courtesy of the official blog of the Microsoft Outlook product team. More on schedule view here. I already can’t wait to move to Outlook 2010 at work, just because of the threaded email conversation view. Not everyone likes it but just from using it on the private account, I know it will make my work inbox easier to manage. It was fun taking a walk with my father-in-law in the Eldred King Woodlands north of Stouffville. Ontario is beautiful. I took a couple snapshots and then experimented with the settings in Lightroom. The results can be seen below. 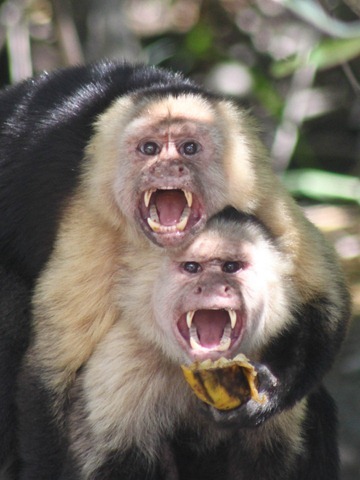 Not sure what these two monkeys were upset about (while sharing a banana) but it made for a great photo opportunity. I took this photo during a boat tour in Palo Verde national park. More photos from the tour are available here.